Hidden in the green valley of the River Till, Ford and Etal Estates is one of the secret gems of north Northumberland. Full of fascinating history, with activities for all the family and quiet footpaths connecting farms and villages, the estates are both a working community and a rich and unique visitor attraction. As a local resident who grew up on the estates, I’d like to take you on a journey through the heritage of the area, and some of my favourite haunts and activities. A great place to start is Heatherslaw, where there is a visitor centre with information on all the walks and attractions. There’s been a mill on the river at Heatherslaw since the thirteenth century, and the current building dates to the nineteenth century, when the estates were a busy hive of agriculture and rural crafts. The water wheel still turns, and the flour can be purchased in the gift shop. 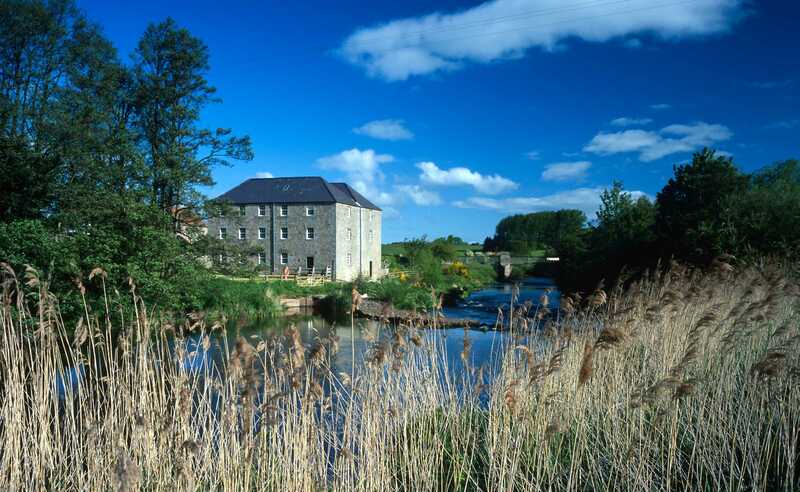 Visitors can discover the workings of the mill, with trails and activities for children. In buildings that were once grain stores and drying kilns, local artists have taken up residence, producing handmade jewellery, papercut art, and lino and screenprints. Just a walk across the bridge from the mill, at the site of an old forge, catch the Heatherslaw Light Railway – a fantastic adventure for families, with steam and diesel engines running along a beautiful stretch of riverbank to the next village, Etal. At Etal, my highlight is to explore the ruins of the fourteenth century castle. Parts of the curtain wall, gatehouses, and the great stone keep can still be seen, but standing on the grass on a sunny day, it’s hard to imagine the place as a site of bitter border warfare. Information boards and an audio tour tell the story of the castle, including Etal’s involvement in the Battle of Flodden in 1513, the largest battle ever fought between the kingdoms of England and Scotland. The site of the battle is also on the estates, just a few miles away and accessible on foot. Etal itself is a peaceful village, with walks along the river, where you’ll also discover the workshop and display room of local wooden furniture-makers, Taylor and Green, in what was once another old mill. For those who want to go even further back in time, the earliest history of the estates can be found at the Maelmin Trail in Milfield, where local archaeology going back 4000 years has been faithfully reconstructed. Stand in the centre of a Bronze Age henge, or enter the Dark Age house and imagine life as it might have been when nearby Maelmin was an Anglo-Saxon royal township. The open air trail is free to visit, and while access is easy from the road, it’s hidden behind a belt of trees, giving it a secluded and atmospheric feel. Returning now to Ford, we come to more recent times. The Lady Waterford Hall mustn’t be missed in a visit to the estates – the building is a masterpiece, the work of Lady Louisa Waterford, a talented artist of the Pre-Raphaelite style, and owner of Ford estate in the late nineteenth century. Her incredible murals adorn the walls of the hall, which was built as the village school. Real individuals peer from the faces of the biblical characters, for estate workers and schoolchildren became artist’s models. Alongside the paintings, you can find information about the Victorian school, and about the fascinating life and work of Lady Waterford herself, while children can experiment with pen and ink, or try on Victorian clothes. Before you leave the village, don’t forget to drop in at the Horse Shoe Forge. 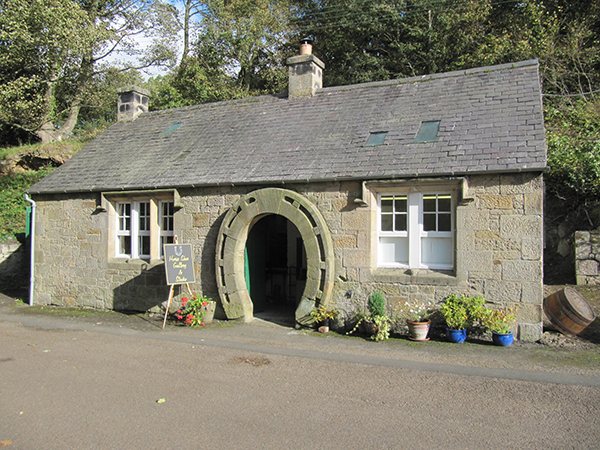 Now housing rare books, antiques and local art, its old function as the village smithy is preserved in the lovely original door, shaped like a horse shoe. Above Ford is my favourite of all the walks on the estates, Ford Moss. Once a mining village and now a nature reserve, people and industry have given way to birds, lizards and butterflies that make their home among the moss of a peat bog. This can be a short stroll from your car, or a longer walk up to the top of Goats Crag Hill, with stunning views across the estates to the Cheviot Hills. For animal-lovers or farming history enthusiasts, another great stopping-point is Hay Farm Heavy Horse Centre. With entry by donation, you can meet the great Clydesdale and Shire horses that would once have pulled the ploughs on every farm, as well as other rare breed farm animals. Displays and artefacts pay tribute to the old farming methods that shaped the estates. With facilities and places to eat in all the villages, as well as gift shops and local crafts for sale, Ford and Etal makes a perfect destination, with more to discover around every corner. A single day really isn’t long enough! Discover why #ItsInOurNature and get inspired to make Northumberland your next holiday destination!